Next morning we were back at work with a whole list of hotels for inspection. The first was Amata Resort. The entrance of this stylish resort has a feel of a large wooden sailing boat with wooden panelled open roofed corridor leading to the pool & beach beyond. 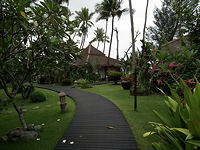 The wooden cottage style buildings are set among the lush gardens. The rooms are spacious & stylish with good sea views. We are using this 4* resort in our superior hotels category. Next we visited the Sandoway Resort. The first sight of the resort is the strikingly pink wall by the entrance leading into green & lush gardens of exotic plants & ponds. The bungalows are set among the beautiful gardens. All the rooms are stylishly decorated & designed but there is no television in the rooms. There is a big screen cinema room with a nightly choice of movies. This resort has a feel of the colonial period because of its library. We have been using this resort in our deluxe hotels category for many years now & we will carry on doing so. 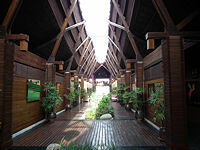 The Aureum Palace Resort entrance is most impressive with a long wooden walkway with ponds on each side. It leads to a large platform for the reception in a teak-pillared lobby. 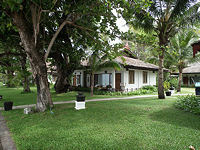 All rooms are in cottages among the green & lush tropical gardens. The rooms are large & stylish. The resort bar is a built like a boat on the sandy beach at the end of the hotels wooden decking. We are using this 4* resort in our superior hotels category. We came to Thande Beach Resort next. This resort is a sister to that resort of the same name in Bagan that we have been using for our clients for many years now. The theme of Thande hotel is the acres of landscape gardens. The superb gardens are laid out with tropical plants, flowers & trees facing the ocean. All rooms are large in individual bungalow style. The wooden wall panels in the rooms make it a very local traditional style. There are reclining chairs at each bungalow's front patio to enjoy the gardens, the sea & the sunset. There are tables on the decking right by the sandy beach for your meals & drinks by the sea. We are continuing using this lovely & popular 3* resort in our standard hotels category. The Bay View Resort is my favourite resort in our superior hotels category. The resort is elegant & architecturally interesting & laid out in a boutique style. The layout of this resort is unique. It starts with the simple & quiet style of the lobby. Behind it a corridor of pot plants on both sides leading to the bright & elegant swimming pool surrounded by palm trees in a secluded courtyard. Wooden sun loungers with white cushions & white parasol lay alongside the swimming pool. It has a the relaxed atmosphere of a private house. Beyond the pool on the other side has another decking area for sofa & table under the white parasol for drinking. The restaurant & bar is at the end on the beach. The rooms on both sides from here along the beach are the closer to the beach than another resorts in the area. Each room has its own front patio area with chairs & table to enjoy the sunset. Although we visited the Silver Beach hotel, it is too basic for us to be able to use it but I wonder how long it will be before it is redeveloped into a 4-5* hotel. The last resort we visited was the Amazing Resort. This is a large resort with acres of beautiful landscaped gardens & palm trees. 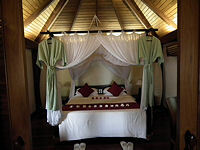 All rooms are large & decorated in traditional local style. All rooms are sea facing. We are using this 4* resort in our superior hotels category. It was time to take our flight to back to Yangon. We arrived back in Yangon in the late afternoon & checked in at the Kandawgyi Palace hotel. We have used this hotel since 2005 & I remembered its beautiful gardens alongside the lake. I returned 7 years later & stayed in a lake view room & I was not disappointed at the view again. Our room was on the lower ground floor & had a balcony like patio outside with wooden chairs to look out onto the beautiful public park & lake. From our hotel room garden patio we can see local people walking across the wooden walkway over the water hyacinth beds of the lake. That night, 29th April, was a Sunday night. We remembered that 7 years ago we stayed at Traders Hotel & had a wonderful seafood buffet. We tried again that night & it was still good. The lobster, the fish & the prawns were all excellent. Try it out even if you are not staying at Traders hotel in Yangon on Sunday night although don't leave it too late in case the good seafood is gone! Next morning we visited our local office in Yangon before we took our flight to Mandalay.